This is a 2.5lb loaf of pure, delicious, buttery bliss. We are located in the beautiful Loudon, New Hampshire and pride ourselves on sourcing local ingredients whenever possible. We always use our own farm fresh eggs. The high quality, natural ingredients in combination with lots of love and care create the ultimate loaf of banana bread; moist, rich, sweet and utterly delicious. Let the freshness of the New Hampshire mountains come to you! Because it's true...chocolate does make everything that much better. This loaf of banana bread is buttery, moist, chocolatey goodness. If you plan on serving it warmed with a big ol' pat of butter, you might just want to buy two. You would be surprised at how fast 2.5 lbs of banana bread can disappear. Just. Like. That. Summer-in-a-loaf. The secrets to this seasonal 2.5 lb loaf of moist banana bread are ripe, juicy, freshly-picked New Hampshire strawberries. The high quality, natural ingredients in combination with lots of love and care create the ultimate loaf of strawberry banana bread; sweet, fruity, rich, buttery, and quite crave-able. This beautiful seasonal creation is only available during strawberry season and does quite well in the freezer. So do your taste buds a favor and get a couple loaves for your and your friends to tide you over through the winter months to come! 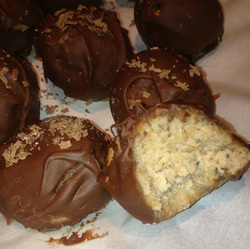 You have not experience banana bread in all it's glory until you have tried a banana bread truffle. 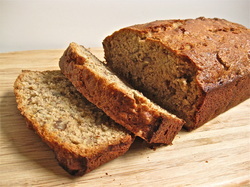 Moist, buttery, rich banana bread enrobed in high quality chocolate. Each order contains one dozen wonderfully delicious truffles. Perfect as an afternoon treat with a cup of tea or coffee. 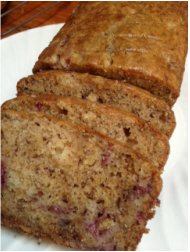 But we won't tell anyone if you sneak a couple in for breakfast...it is still banana bread after all! We are located in the beautiful Loudon, New Hampshire and pride ourselves on sourcing local ingredients whenever possible. The high quality, natural ingredients in combination with lots of love and care create the ultimate banana bread truffle; moist, rich, sweet and utterly delicious.